Today begins our second annual chapbook call! We’re looking for 10-20 pages of poetry and/or flash fiction from a Canadian writer who has never had a chapbook or full-length book published (self-published authors are exempt from this restriction, as this restriction is in place to allow emerging writers without publisher representation an opportunity to become a more active part of the Canadian literary scene). Previous Quilliad contributors are welcome to apply. We will be paying a $50 honorarium to the selected writer as well as providing the author with 5 copies of their book free of charge (subsequent copies can be purchased by the writer at half price). We will also consider poems from the submitted manuscripts of 2 runners-up for issue 9 of The Quilliad. Publication in The Quilliad will be compensated with an honorarium and contributor copy. To submit, send your writing to thequilliad@gmail.com by January 15, 2017. Our Chapbook Call Ends Sunday Night! Just a reminder to everyone that our chapbook call is nearing its end, but there’s still time! Send us your work before midnight on Sunday if you’d like you poetry or short fiction to be considered. See below for guidelines. We will be paying a $50 honorarium to the selected writer as well as providing the author with 5 copies of their book. We will also consider poems/flash fiction pieces from the submitted manuscripts of 2 runners-up for issue 7 of The Quilliad. Publication in The Quilliad will be compensated with an honorarium and contributor copy. To submit, send your writing to thequilliad@gmail.com by December 13, 2015. The Quilliad has a Kickstarter for issue 3! We are excited to announce that The Quilliad has started a Kickstarter for issue 3. We want to do more and be better with every issue, and our Kickstarter is going to be a part of that. Be part of a new voice in Canadian literature and the arts. Be part of The Quilliad. P.S. Reminder: our submission call for issue 3 is currently open (residents of Canada only please). See our submissions page for details. Besides a few appearances at local literary and arts events, The Quilliad has been in hibernation for the winter, but soon we will begin working on the next issue. Our submission call will be going up within a week, so keep an eye out for that! We’ll be looking for art as well as literature this time around. 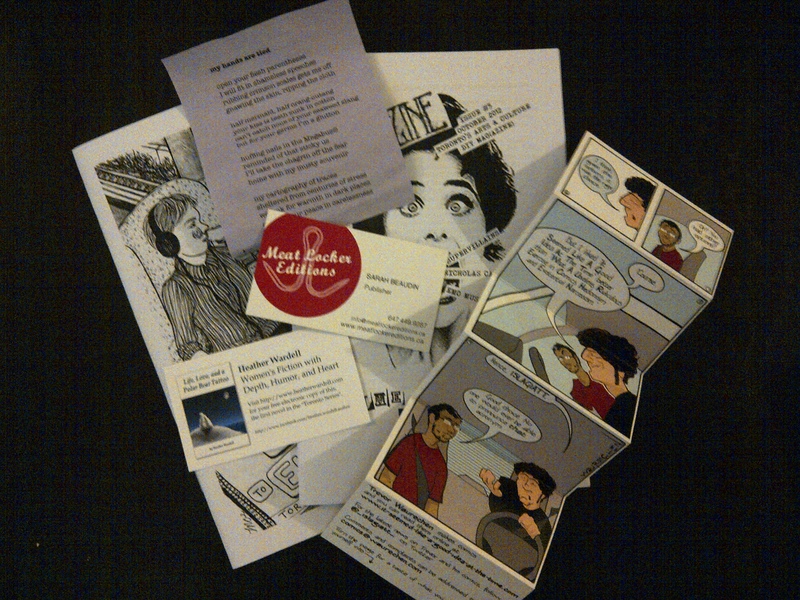 We’re also gearing up for the spring craft and lit festivals, so expect updates on where you can find us. The Quilliad had a great time at today’s TIAM event. 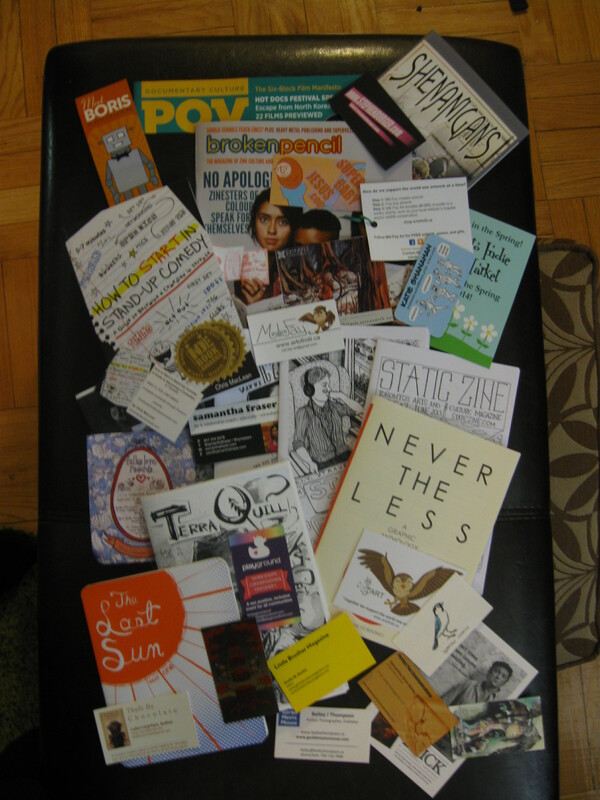 It was refreshing to meet so many enthusiastic small press reps and network with potential contributors! We look forward to future events. One of our contributors, Jessica Bebenek, was there with an assortment of her chapbooks and homemade notebooks (she runs Grow and Grow, “a small press for big ideas”). Take a look at all the cool stuff we got! The Quilliad: Issue 2 is out! The second issue of The Quilliad is in print and online. To purchase a hardcopy, email thequilliad@gmail.com. (Hardcopies are $6.00, including postage, to Canada and the United States. Please inquire regarding pricing outside of North America.) For a digital copy, go to our Smashwords page for the .epub (The digital copies are 2.99. If you have trouble opening the .epub, we recommend Firefox’s epub reader add-on or Adobe Digital Editions, both of which are free). Please note that there have been some issues with formatting the digital edition, so at present the .epub file is your best bet unless you want a hard copy (which is beautiful).